Rather than using Tarot to predict the future, we can use it as a transformational tool, either for ourselves or the people we read for. 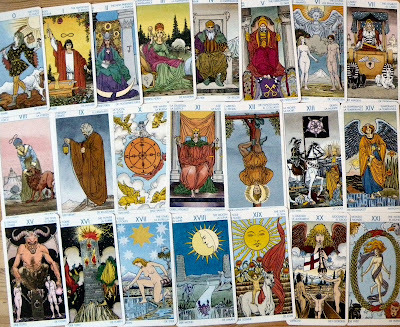 Each of the magical images of a Tarot deck offer us unique guidance and universal truths throughout life. 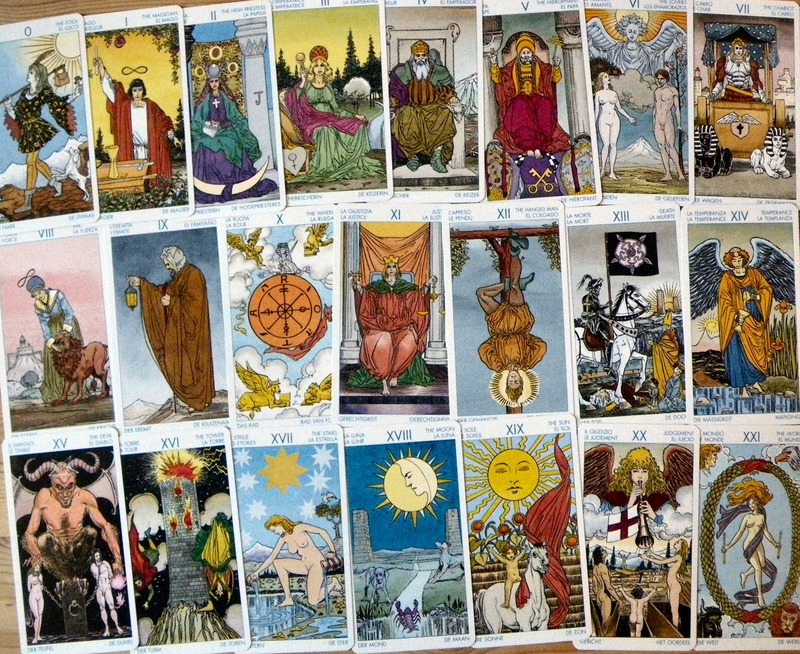 I have compiled a list of life lessons, which relate to the 22 cards of the Major Arcana. Live in the present. Don't dwell on the past..You do not know your future. Learn to enjoy the present moment and experience life in the 'here and now'. Stay focused on your goal and take action every day towards achieving it. Even with limited resources you can reach your full potential; believe in yourself. Follow your intuition. You can listen to other people's advice, but also listen to your inner voice; do what you know deep down is right. Nurture yourself as much as you nurture others. When your own needs are met, you are more capable to take care of those who need you. Give your dreams and ideas a chance to come to fruition. Focus on just one or two and persevere. Whatever the outcome, you will either be successful, or you will learn something. Learn from your mistakes and value the lessons they offer you; making mistakes is often better than doing nothing. Spend time with the people you love and make you feel loved and appreciated in return; life is too short to tolerate anyone, who keeps making you feel miserable. Sometimes it's good to break out of your comfort zone. Magic often happens on uncharted territory. Have the courage to push yourself to experience new challenges. In your mind and spirit you are stronger than you think. Trust in your abilities to overcome any obstacles with willpower and determination. Stay positive. Enjoy what you already have instead of wanting to accumulate more. There are simple pleasures to be had every day easily within your reach. Focus on inner rather than material growth. You are not always in control of your destiny, but it it's up to you how you respond to the ups and downs you experience in your life, and how you perceive them. Every cloud has a silver lining. Be honest with yourself and those close to you. Act with integrity and only say what you mean. Accept accountability for everything you do and say. Rest assured that even a period of stagnation will come to an end. A new perspective, thinking outside the box, a different point of view will give you the momentum to take a step forward at the right time. Nothing ever stays the same. Things change. People change. You change. Endings can be painful, but they also lead to new beginnings. And that's a good thing. Be ready for your future. Eat less, chew more; talk less, listen more; hate less, love more; fear less, hope more; whine less, breathe more; blame less, praise more; work less, live more. Don't be a slave to the system; if you don't like the situation you're in, get out of it. Even after years of apathy, remember that you still have a choice and you can move on. Yes, you can. Pay attention to your stress levels and allow yourself time out. When you notice you are close to breaking point, slow down, take a break, breathe and relax, so you can move forward with clarity and purpose. Genuinely care for people and show them kindness. Just like a guiding light, give hope and comfort when times are dark.It may also make you feel better, too. It’s no good hiding your emotions just because you want to keep the peace with others. Avoid resentment and bitterness by expressing your feelings without fear. Seek happiness for others, and you'll find it for yourself. By making others happy, you will be happy in return. No regrets. They don't work, because you cannot undo the actions you took in the past. What's done is done. Learn from your mistakes and forgive yourself. Be yourself. Live life true to yourself and not the life others expect from you. Embrace opportunities and challenges to develop new or latent talents. Each card can offer many more life lessons we can take to heart and learn from. 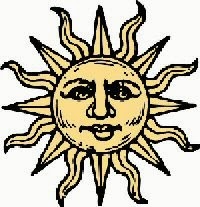 Which important lessons have you learned so far, and which Tarot cards would they relate to?